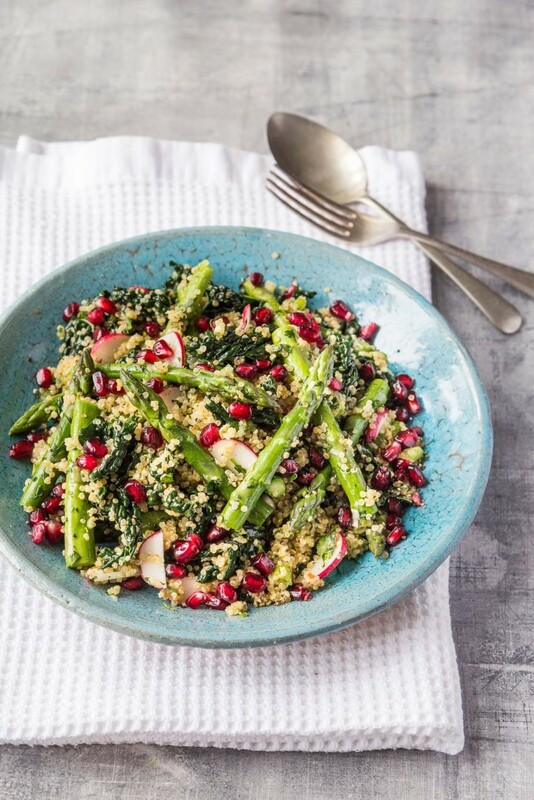 This flavoursome bowl of goodness packs plenty of greenery in the form of fresh British asparagus and kale in with a naturally high source of protein, quinoa. Vegan, quick-to-make and delicious. Add the quinoa to a small saucepan and pour over the hot stock. Bring up to the boil, reduce the heat to low, cover with a lid and cook for 15 minutes until the grains are tender and the stock absorbed. Meanwhile, make the dressing by adding the lemon juice, honey, garlic and mustard to a mixing bowl and whisking together. Slowly pour in the olive oil whisking until you have a thick creamy dressing. Season with salt and freshly ground black pepper. Bring a large pan of lightly salted water up to the boil and tip in the asparagus. Simmer for 2 minutes until just tender but with plenty of bite. Remove with a slotted spoon to a colander and allow to drain then tip onto a plate and allow to cool. Add the kale to the boiling water and cook for another 2 minutes then drain and rinse under cold running water to cool quickly. Drain well, ideally spinning dry in a salad spinner. Add the kale to the bowl of dressing, along with the spring onions, parsley, radishes and blanched asparagus. Toss together lightly to mix. Once the quinoa is cooked, fork through the grains to separate and tip into the salad, lightly mixing through. Spoon onto a serving plate and scatter over the pomegranate seeds before serving.